Chris and Amy and their four children relocated to Atlanta from Connecticut. They were looking for a family friendly neighborhood in an outstanding school district. The choice was easy! 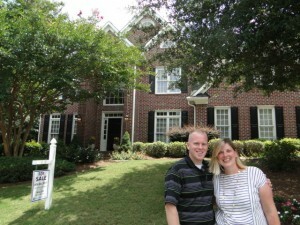 We found a wonderful home with a finished basement in Easthampton in the East Cobb area of Marietta. Easthampton is one of my favorite neighborhoods in East Cobb and is in the Mt. Bethel Elementary and Walton High School districts. It has wonderful amenities including a community pool with water slide, tennis courts, playground and lake.